Yay! Received my order from Printcious few days ago and they are all personalized. I specially designed it for my bffs and myself too. When we received gifts or souvenirs that are personalized or custom made, I’m sure we will be more delighted than the usual ones. Personalized gifts are unique and holds a special meaning, it’s the thoughts and efforts that count. Here are my cushions, mini tees, t-shirts and mousepad that I ordered from Printcious and received it within 3 working days. 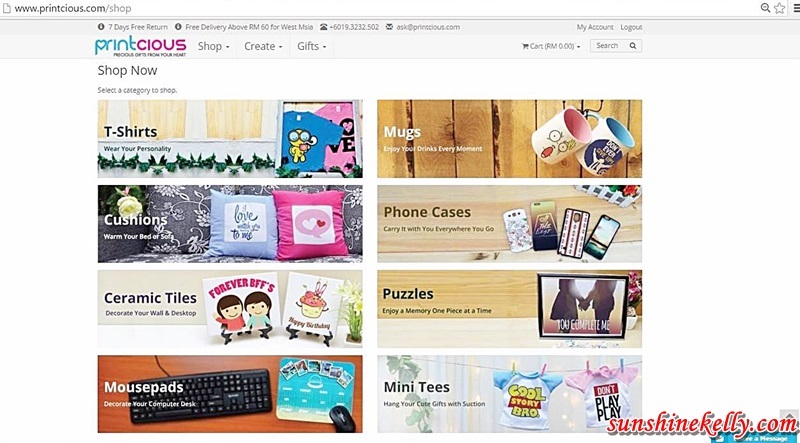 Printcious which stands for Printing of Your Precious Gifts, is a B2C online platform for customers to customize their DIY gifts with their very own design, picture or text. They have cushions, t-shirts, mugs, phone cases, ceramic tiles, puzzles, mousepad and mini tees available for us to choose and customize. They have an user friendly customization tools for us to work with on their website. For example, I choose the cushion and select the basic design Love Love Love that I like. Then I can either keep it to red or change the color of the cushion. So I decided to keep it red because it’s my favourite color and then press customize it to I add the text and image that I wanted. I can add any text that I want, choose the font type and size plus I can add image in the center too. For me the whole process of designing this took about less than 5 minutes. Step 8: Congratulation. Your order has been confirmed. Overall, I like the thoughts of personalized the gifts for my friends on their special days such as birthday, wedding, graduation or anytime when we feel like showing our appreciation to them. Printcious also offer quite good selections of gift and their customization tools are user friendly also. I am happy that my order reach within 3 days and everything is in good condition according to what I ordered. Address: 30, First Floor, Jalan Tiara 4, Bandar Baru Klang, 41150 Klang, Selangor Darul Ehsan, Malaysia. It look so easy to design and order! So cute and personalized! love ittttt! Printcious are so famous. My friends suggested this Printcious too. I will order the customize pillow for my niece's birthday. Oh Kelly! love your personalised cushion. So kawaii! not bad. I would want to personalize my own pillow! ISAAC IS AWESOME, and sleep on it.